Jason Mohammed … struck his ninth first class hundred. 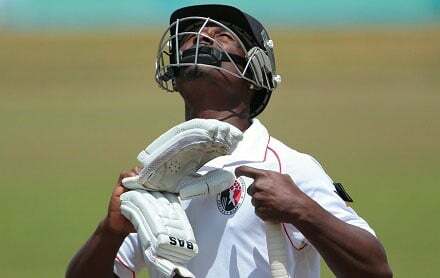 TAROUBA, Trinidad, CMC – Jason Mohammed’s ninth first class hundred repelled a strong challenge from Jamaica Scorpions and left Trinidad and Tobago Red Force scenting victory, heading into Sunday’s final day of their rescheduled first round match in the Regional Four-Day Championship. The 32-year finished yesterday’s penultimate day unbeaten on 108 as the hosts marched to 282 for nine in their second innings – already a lead of 324 runs. Mohammed had narrowly missed out on three figures in the first innings when he perished for 94 but he made no mistake this time around in a knock that came from 152 balls in 187 minutes, and included eight fours and three sixes. He got support from opener Kyle Hope who made 47 while Jamaican pacer Odean Smith lashed a lively 30 off 28 balls with two fours and two sixes. Nkrumah Bonner had earlier stroked his second half-century in three outings when he made 61 as Scorpions were dismissed for 347 in their first innings. Resuming the day at the Brian Lara Stadium on 42 with his side on 282 for six, the right-handed Bonner did the bulk of the scoring, striking 10 fours off 116 balls in just under 2-½ hours at the crease. He was eighth out after adding 31 for the seventh wicket with Kennar Lewis (10) and 25 for the eighth wicket with with Akeem Fraser (17 not out). Rookie pacer Anderson Philip claimed five for 74 – his maiden five-wicket haul – while Test speedster Shannon Gabriel picked up three for 51. Ahead by 42 on first innings, Red Force quickly plunged to 86 for five before Mohammed anchored three crucial stands to steer the home side out of trouble. He posted 53 for the sixth wicket with Smith, a further 49 for the seventh with Khary Pierre (21) before adding 56 for the ninth with Phillip (16). Jermaine Blackwood, trundling his medium pace, claimed three for 39 while off-spinner Akeem Fraser finished with three for 56.